My chat with Kurt last year. 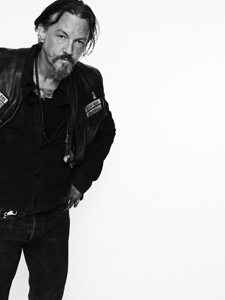 Kurt Sutter is an incendiary, wild, and extremely fun showrunner. His show is owning the ratings due to its combustible content, amazing cast of rogues, and the way he’s managed to weave the soapy elements into an edgier show. It’s actually rather brilliant how he’s taken a counterculture idea and made it mainstream without being totally toothless. Yes, it strains credibility on a weekly basis but it’s not mere junk food. Whether through his hilarious and vulgar dust-ups with critics on Twitter, his sicko performance on the show at Otto, or through other periphery, the dude rocks. I was lucky enough to participate in a conference call with the man about the end of the show’s fifth (of seven he says) season. It was a good season, one of the best the show has had and unlike many others it seems to be still gaining momentum. Really quick. You made it through five seasons, and you have maintained your focus, your integrity and not jumped the shark, and the ratings have gone up. You’re so atypical, yet you still manage to break up the craziness with an episode like what you did with Walton Goggins. I think I speak for a lot of people when I say thank you for not losing your way. It’s so hard to pull this off. Thanks, I appreciate that. I spent a lot of time trying to figure out what I wanted to do, and what I was good at. I’m probably about ten years older than a lot of my fellow show runners doing this job, so I just have a great appreciation and a lot of gratitude for where I’m at, and I don’t ever take that lightly. I dig what I do. I’m plugged into it. I think because I do enjoy it and because I have such a deep sense of ownership and pride involved in it, I don’t think I’d ever want it to let it “jump the shark.” I think that when that happens on a show it’s because the creative motor behind it just becomes distracted or bored, quite frankly. I try not to do that. This show is my priority. I do other things in my downtime. It really is kind of my labor of love, and I have every intention of maintaining that and following through and finishing that as strongly as we’ve managed to do so far. The funny thing, there’s a moment of the show that really stuck out for me above all the big moments was a small one. It was Bobby turning in that badge, turning in his vice presidency. To me that was the most important part of the episode because the MC is rudderless right now. The heart and soul is completely devastated, and I’m kind of wondering is that going to be, now that Clay’s in prison, this fractured group? Is that the thrust of the next year? Yes, I think that was part of the irony or the tragedy for me really. Jax has pulled off ─ we had this list for Jax at the beginning of the season, the writers. It was this sort of checklist of things that what does Jax want? Jax wants to get out of the drug business. Jax wants to get out of the cartel business. Jax has to get rid of RICO. Jax has to have Clay get his payback, his revenge on Clay. He had all these things that he needed to do, and he methodically and brilliantly achieved all those goals this season. At the end of it, all those tasks were done, but the fallout came on all the personal sides of that, so that both families were in shambles. Now he has a club that has no more external pressures. There’s no more RICO case against him, there’s nobody holding a gun to them anymore. He’s got this relationship now with Eli so that there’s no sort of pressure in town. He’s removed ─ he’s gotten out of the big gun and the drug business. His new businesses for them, the Deosa, they’re making money, the thing with Charming Heights, and yet the club itself is in complete shambles. His inner circle is really reduced to two guys now. Bobby was sort of the last voice of reason, and Bobby turning in that VP patch, it’s not that Bobby’s leaving the club but he’s saying that I can’t do this job because you won’t let me do this job. The club itself is really, it’s got all these wonderful opportunities, and it’s ready to flourish, and yet part of Jax’s job next season will really be about now I’ve removed all the external things. How do I fix it from the inside? That’s always a challenge, doing something larger in the beginning. I really wanted to do that with Opie. I didn’t want to drag it out, sort of have people, not see it coming because of bad execution, but see it coming because of the natural progression of the world. I really wanted it to be shocking, come as a complete surprise, and kind of knock the wind out of not only the audience, but the club as well. 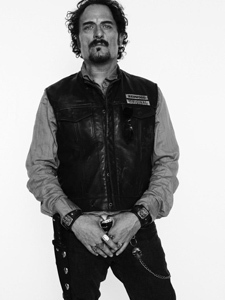 What I was able to do really with the death of Opie, and not so much about worrying about having the rest of the season be a let-down, but really what it gave me was such a life-altering circumstance for my hero that it really allowed me to accelerate his journey. I really wanted to get to the place where we had to force Jax’s hand to see what kind of a leader he was going to become. 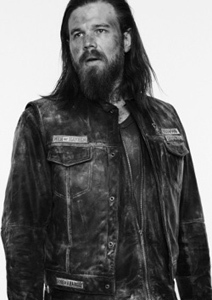 I feel like the death of Opie, that deep tragedy, that’s such an unsettling event, really allowed me then to sort of accelerate the emotionality of that journey, so we could sort of organically push Jax to the edge to see what kind of a man, what kind of a leader he was going to become. In that way, it really probably opened up my story possibilities rather than hindered them. I can definitely tell you that Donal will be back. We’ve made a deal with Donal. We’ve made it for a total of 10 episodes so far. I think he was in two or three this year. We definitely have him locked up for seven or eight next season, and most likely it will be more than that. What we usually do is make a minimal deal with an actor, and then if we need them more we can do more. That character, I believe, will be a big character next season, and probably the most dangerous threat that the club has ever had. Just in terms of a law enforcement guy with kind of law enforcement weight, law enforcement credentials or connections, and yet because he is retired does not have perhaps the legal handcuffs or morality hurdles that maybe some of our other law enforcement members have had. With a guy like Donal, who is just … fun to work with and such a great actor, we have a lot of places we can go with him. Jimmy Smits, I would love to bring back. I think Jimmy adds such a gravitas to the show, good experience. I love bringing in that new sort of culture to the show. 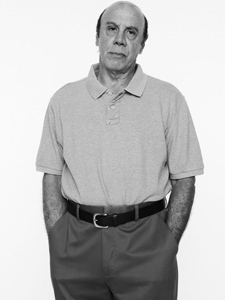 His sort of Latino past and that energy, mixing it into our world is really fascinating for me. I love the relationship that is going on with he and Gemma. I would love to bring Jimmy back. We left it sort of open-ended because I wasn’t sure on his availability. I feel like there’s enough emotional weight on the table, there’s enough relationship weight on the table for us to continue that storyline, and yet I was careful not to pin any major story arch to his character just in case that couldn’t happen. I think we’re in the process right now of trying to figure out Jimmy’s availability and trying to make that work. Yes, my general rule, what I tend to do is, I come in with a blueprint in the beginning of the season and I sit down with my writers, and I sort of lay out what I want to do for the season. It’s a loose blueprint, and the more I do this and the more confident I get with the show in terms of the stories that we tell, I’ve really been able to hold onto them a little more loose each season. My grip gets a little looser as the mythology progresses. That was the case this season. I had these ideas, and we started writing toward those ideas, but if something happens organically in the process of telling the story, if something else comes along and we want to play it out, then I have the room to do that and to go in a different direction. If I see something that’s popping on screen in terms of a relationship or a conflict that’s really suddenly taking on a much more compelling quality than I thought it was going to be, then I’ll throw some energy and some story at that. I have some leeway. You have to be careful at a certain point, usually in the back four or five episodes, then your leeway really starts to diminish. Not that you have to start writing to tie everything up in each story, but I do have the reality of okay, this is how much time I have left this season to tell these stories. As time progresses, as the episodes pass, then you’re ─ that doorway gets a little more narrow. 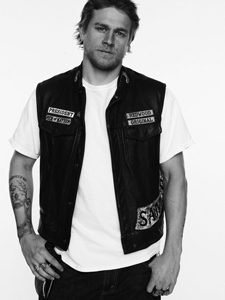 I really wanted to get to a place with Jax at the end of the season, and one of my desires at the beginning, as I said, the death of Opie allowed us to really accelerate Jax’s emotional journey in terms of where he was going to be at and the decisions he was going to make. I really wanted to get to a place where perhaps Jax realizes that he’s better at being an outlaw than he is at being a husband and a father. There is an allure that comes with power and prestige that perhaps he wasn’t aware of, or maybe he was aware of, but didn’t necessarily have to make a decision one way or the other earlier. He got to the end and as much as he says he wanted to leave, that perhaps he really wasn’t ready to leave. The intent was to have him have this very successful, although bloody and tumultuous, and tragic or painful run as president of the club, but to ultimately have all that stuff come out almost flawlessly. The execution of Pope, the way he maneuvered that. He pulled that off like a spec ops soldier. All that stuff went flawlessly, and was incredibly smart. While all that was going on on the outlaw side, all the stuff with his family was essentially falling apart. He couldn’t keep any promises to Tara. Everything was a false promise. The bottom fell out of everything. At the end of it, he does one incredibly well and one incredibly bad. Just the idea, maybe I’m supposed to be doing this and not be doing that. I’m not saying that’s where we are ultimately going to be with the character, but in this moment at the end I think there is a sense of I’m completely successful on the one hand, and yet I’ve completely failed at this other thing. Maybe I’m just supposed to be doing the thing that I’m good at. That’s really where I wanted to have him land at the end there.